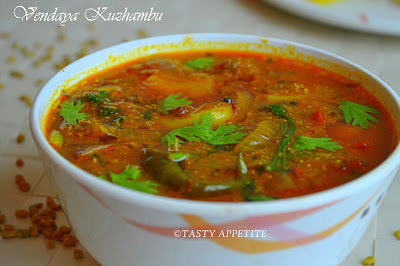 Today’s recipe Vendaya Kuzhambu is one of my Grandma’s signature recipe. 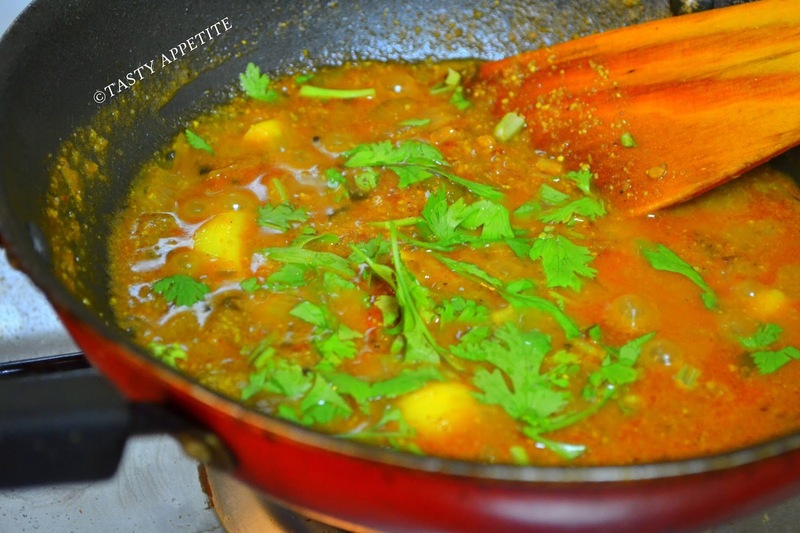 This is a quick fix dish and tastes heavenly delicious. This tangy, spicy South Indian dish is more like a vathakuzhambu, but with a nice flavor and taste of fenugreek or vendayam. I made this last week and it came out very yummy. We know fenugreek are very good for diabetic and heart patients as it has good fibre content and helps in controlling blood sugar level and cholesterol. 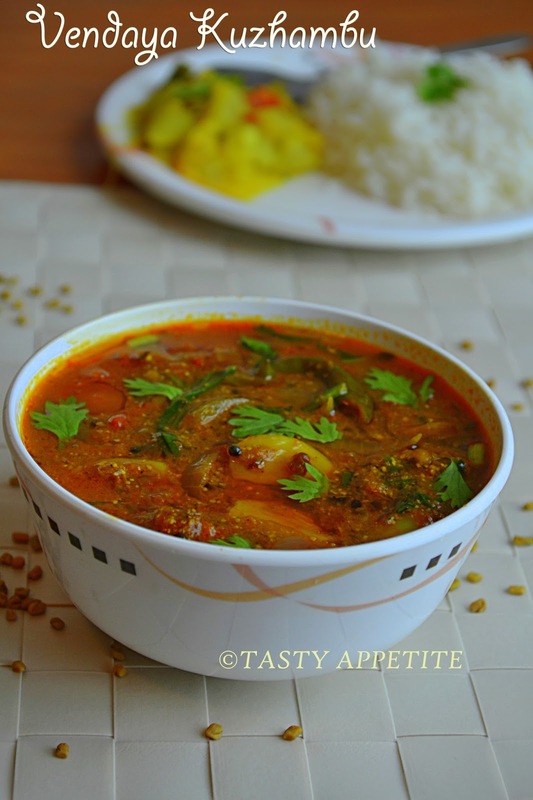 This lipsmacking fenugreek seeds gravy goes well with both chapathi and rice. 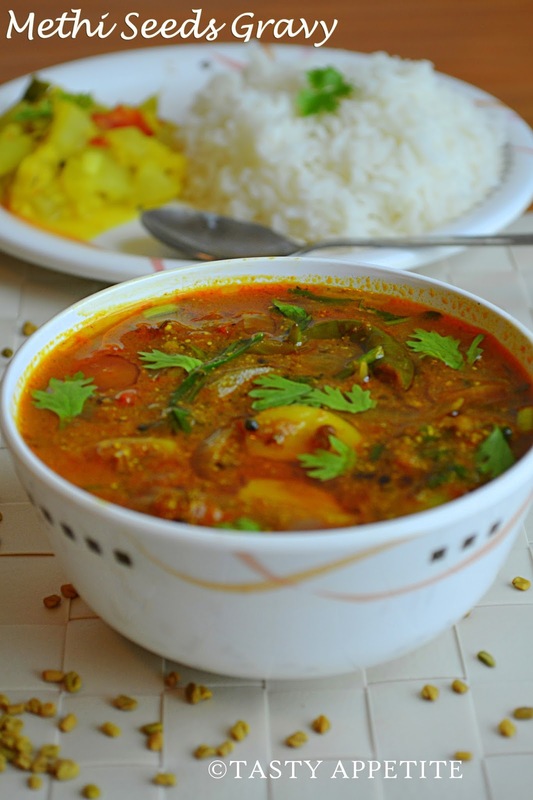 We enjoyed it with hot steamed white rice, papad and kootu. · Tamarind - small lemon sized ball. 1. Soak small lemon sized tamarind in warm water and take thick extract out of it. 2. Dry roast 1 ½ tsp of fenugreek in a pan, allow to cool and make pwd of it. 3. Heat gingely oil in a kadai. 4. 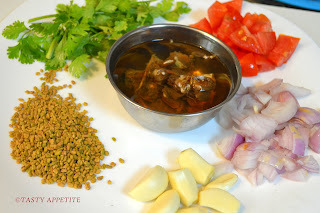 Add mustard, curry leaves, split urad dal, hing, cumin, fenugreek and allow to splutter. 5. Add finely chopped onion and fry till transculent. 6. Add sliced tomatoes, green chilly and garlic. 7. Now add turmeric pwd, red chilly pwd and coriander pwd. 9. Fry till oil separates. 11. You can see oil separates out from the masala. 12. Add thick tamarind extract and boil till it reaches thick consistency. 13. Add freshly ground fenugreek pwd. 15. Turn off flame and garnish with freshly chopped coriander leaves. 16. 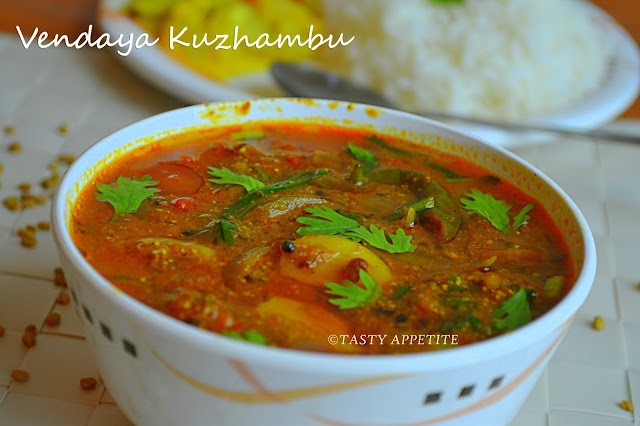 Authentic delicious Vendaya Kuzhambu is ready to eat. 17. It tastes fingerlicking good with hot steamed white rice, pappad and veg kootu. lovely kuzhambu, Jay ! a very very Happy Friendship Day to a very lovely cook!! Have a great day ahead! Delicious and inviting kuzabmu. Increases my appetite manifold. Your kuzhambu looks yummy. Brinjals are not my favourite but this curry of yours look very delicious. 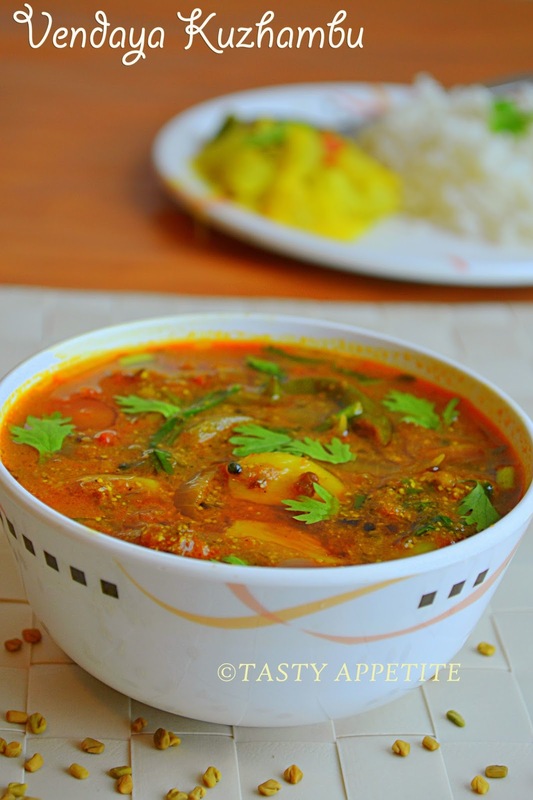 I would love to replace brinjal to some other vegetable & try this recipe. Corporate to Kitchen : I haven't used brinjal in this recipe. Do giv a try n enjoy. Interesting, yummy and very tasty dish. Looks really luscious. jay, i liked this recipe. Never heard about this before..
Looks yumm and delicious. Creamy and has a rich gravy. I tried this today. It was very tasty. I think I wl be preparing this once in a week from now, due to great demand. Thank you for sharing. Delicious curry.would surely like to try it.